This year's historic First Annual Disability Pride Parade will take place Sunday, July 12, 2015 in New York City. The day will be a celebration of people with disabilities joined by their families, friends and thousands of New Yorkers who make up this diverse city. Come and enjoy the music, dance, comedy and speakers! Emcees include Andea Dalzell, Ms. Wheelchair New York 2015. Speakers Victor Calise, Commissioner from The Mayor's Office for People with Disabilities, Councilwoman Rosie Mendez, Councilwoman Margarita Lopez and Michael J. Schweinsburg, Executive Director of DPNYC. Talent is coordinated by Brooke Fox and myself. And hat's off to Brooke, who painstakingly put together the running of the program with constant changes. Mike has been working for several years to create an annual Parade to shine the spotlight on people with intellectual and physical disabilities. 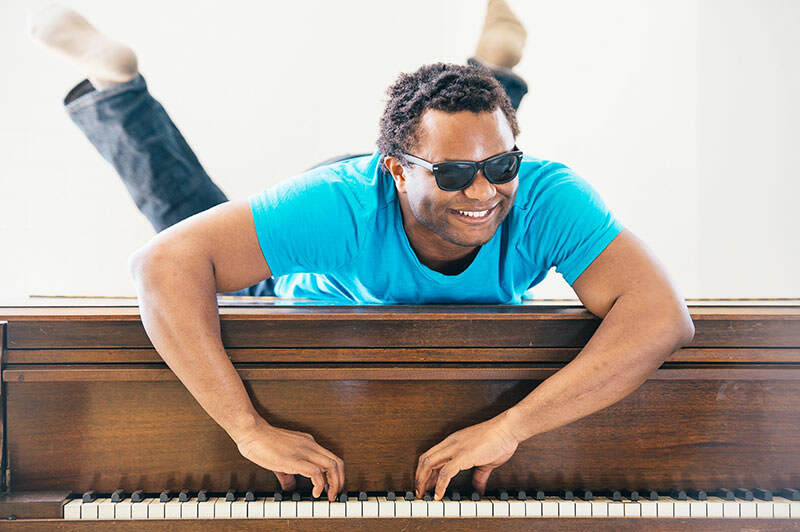 His long-term goal is to set up funds to assist the disability community with needs that are often not covered by traditional insurance often due to their diagnosis. Mike's wife, Margaret Patterson, works full time so Mike cares for Mary when she is not attending The Jewish Guild School for the Blind. He has noticed how her sensitivity and love of music has helped her development and interaction with the world. He got the idea for the Parade while listening to a choir at Mary's school. 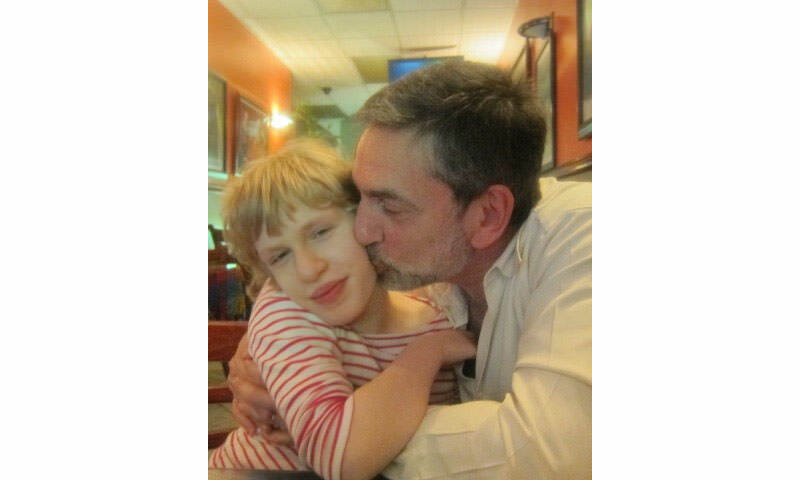 After receiving nonprofit status with 501(c)(3), Mike, along with Executive Director of Disability Pride NYC, Michael J. Schweinsburg, recruited advocates and those with legal backgrounds as volunteers. Eventually a Board of Directors was established, comprised mainly of people living with a disability, who have been meeting for more than a year. 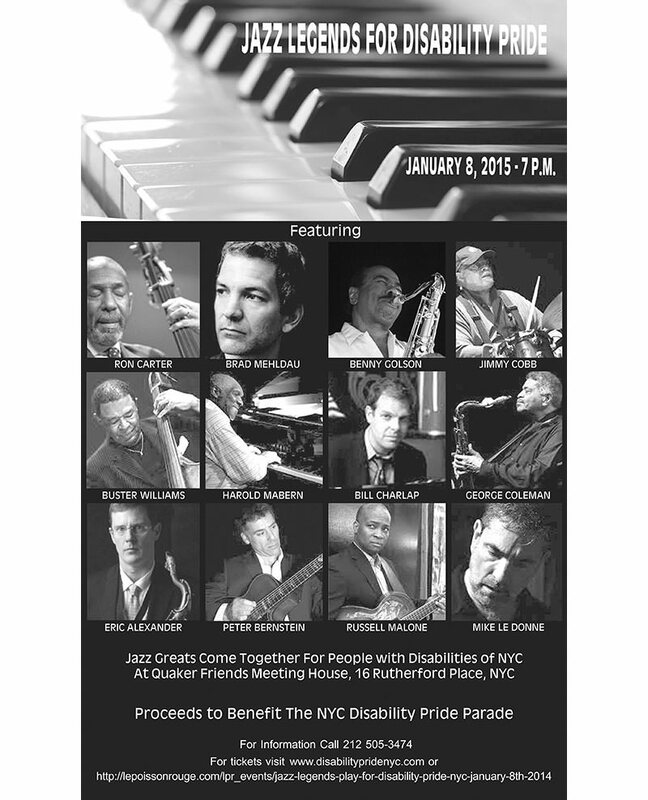 To raise money to get this mission started, Mike LeDonne got some of his "jazz friends" together who donated their time and talent for a concert called "Jazz Legends for Disability Pride." This occurred on January 8, 2015 in NYC. Along with Mike L., prominent jazz musicians including Ron Carter, Benny Golson, Jimmy Cobb and George Colman Jr. & Sr., brought the house down and raised money to make this dream a reality. Despite a cold, rainy night, the house was full with music lovers from all over the world! So, from there the Mayor's office has stepped in to further bring this Parade to fruition. 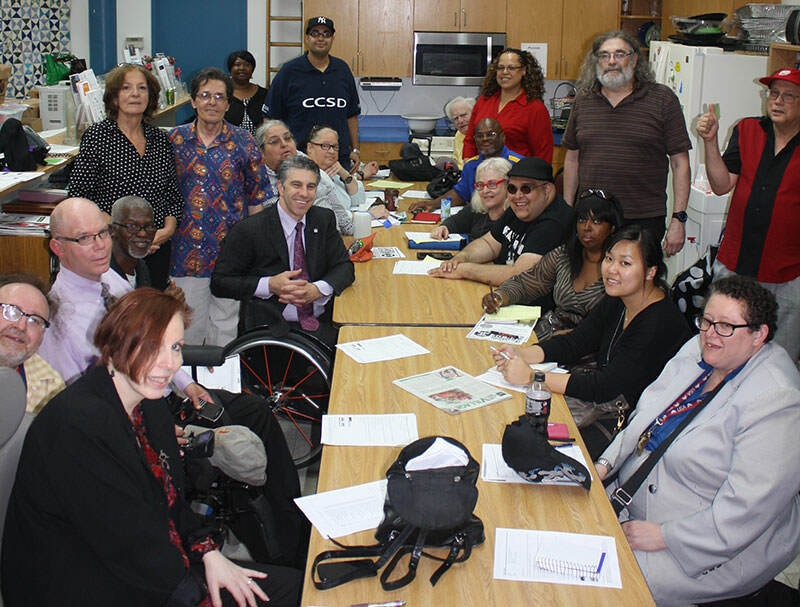 Victor Calise, The Commissioner of The Mayor's Office for People with Disabilities (MOPD), in Mike LeDonne's words "has come through for the disabled community like no other politician on earth would." Mr. Calise became paralyzed following a mountain biking accident in 1994. He states that the parade will allow, "New York City residents and the world to see that people with disabilities are part of society, demand equal rights and most of all, celebrate who we are." The Mayor's office has included other events this July to celebrate the July 26, 1990 signing of the Americans with Disabilities Act (ADA). 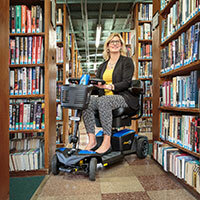 Those events can be viewed at http://nyc.gov/ada25nyc or call 311. We celebrate the 25-year anniversary of the ADA by looking back and saluting the groundwork that was laid for the civil rights law that was completed. The passage of the ADA was a response to a society that did not grant equal status to people with all types of disabilities. Clear discrimination mobilized the disability community to change things through civil disobedience, followed by a more orderly legislative process. In addition to laws, penalties have continued to be sought for those who discriminate against those with physical, sensory and intellectual disabilities. For example, discriminatory acts occur in employment, housing, health care and access to transportation. These ideas were put into the initial writing of the ADA. Many businesses and housing locations, which were only required to do so if they were built after 1990, continue to be inaccessible. Those using service animals are still often banned from many establishments. A quote from Michael Collins spinal cord injury-paralysis blog states, "Celebrate, but don't lose sight of the 'goal'." DPNYC Director, Michael Schweinsburg said, "The goals of the Parade are to instill or reinforce Pride among all members of the disability community, their caregivers, family, friends and supporters; to change the public perception of people with disabilities; and to tear down the silos that segment our community." Through organizing meetings held in every borough, the disability community is uniting to ensure that not only do we put together a truly memorable and impactful event, but that it also serves as a springboard for an ever-growing annual event designed to celebrate our diversity and empower all people with disabilities as well the organizations that support us." Volunteers still needed! Respond to wsabry@cityhall.nyc.gov or visit http://www.nycservice.org/opportunities/1030. Check in will begin at 10 am. You will be contacted in advance as to location. If booking with Access-a-Ride, please use key words: ADA25NYC Disability Pride Parade. Hope to see you there! Come and be a part of history! Ms. Amy Meisner-Threet (aka Amy M. Threet) has been a member of DPNYC since its inception. She has worked with the committee to help organize talent for the parade along with other tasks. She has a Masters Degree in Social Work, is a professional dancer/actress and a published writer on disability issues and the arts. She can be reached at flowslaw@yahoo.com, on Facebook and through online searches for her articles and interviews.